The National University of Singapore is a comprehensive research university located in Singapore, being the flagship tertiary institution of the country which has a global approach to education and research. Founded in 1905, it is the oldest higher learning institute in Singapore, as well as the largest university in the country in terms of student enrolment and curriculum offered. The university’s main campus is located in southwest Singapore at Kent Ridge, with an area of approximately 1.5 km (0.58 sq mi). The Bukit Timah campus houses the Faculty of Law, Lee Kuan Yew School of Public Policy and research institutes, while the Duke-NUS Graduate Medical School Singapore is located at the Outram campus. It is the best university in Asia as of 2013 QS World Rankings. The National University of Singapore was formed with the merger of the University of Singapore and Nanyang University in 1980. This was done in part due to the government’s desire to pool the two institutions’ resources into a single, stronger entity, and promote English as Singapore’s only main language. The original crest of Nanyang University with three intertwined rings was incorporated into the new coat-of-arms of NUS. The vision of National University of Singapore a leading global university centered in Asia, influencing the future. NUS will be a globally-oriented university, in the distinguished league of the world’s leading universities. A key node in global knowledge networks, NUS will have distinctive expertise and insights relating to Asia. NUS aspires to be a bold and dynamic community, with a “no walls” culture and a spirit of enterprise which strives for positive influence and impact through our education, research and service. Every member of this university enjoys diverse opportunities for intellectual, personal and professional growth. Learning and working at NUS will foster quick, well-rounded minds, well-equipped to succeed in our fast-changing world. Transformative education that nurtures thinking individuals who are alive to opportunities to make a difference, are valued members and leaders of society, and global citizens effective in diverse settings. High-impact research that advances the boundaries of knowledge and contributes to the betterment of society. Dedicated service, as a national university, that adds to social, economic and national development. NUS began its entrepreneurial education endeavors in the 1980s, with the setting up of the Centre for Management of Innovation and Technopreneurship in 1988. In 2001, this was renamed the NUS Entrepreneurship Centre (NEC), and became a division of NUS Enterprise. NEC is currently headed by Professor Wong Poh Kam and its activities are organised into 4 areas, including a business incubator, experiential education, entrepreneurship development, and entrepreneurship research. Today, the National University of Singapore has 16 faculties and schools across three campus locations in Singapore – Kent Ridge, Bukit Timah and Outram – and provides a broad-based curriculum underscored by multi-disciplinary courses and cross-faculty enrichment. NUS has a semester-based modular system for conducting courses. It adopts features of the British system, such as small group teaching (tutorials) and the American system (course credits). Students may transfer between courses within their first two semesters, enroll in cross-faculty modules or take up electives from different faculties (compulsory for most degrees). Other cross-disciplinary initiatives study programmes include double-degree undergraduate degrees in Arts & Social Sciences and Engineering; Arts & Social Sciences and Law; Business and Engineering; and Business and Law. Currently, it has seven overseas colleges at major entrepreneurial hubs in Shanghai and Beijing (China), Israel, India, Stockholm (Sweden), Silicon Valley and Bio Valley (US). NUS has been consistently ranked among the best in both Singapore and Asia. The ARWU (2013) placed it in the range of 100–150 worldwide and the best in Singapore. Moreover, in the same academic year, the QS World University Rankings (2013/14) ranked NUS 24th within the world and 1st within Asia, whilst the independent QS Asian University Rankings (2013) considered it to be the second of the list. 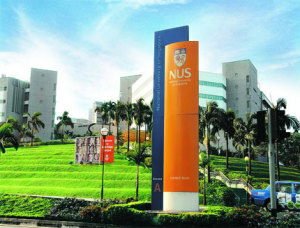 Furthermore, the Times Higher Education World University Rankings (2012–13) placed NUS at 26th in the world and second in Asia, when its World Reputation Rankings regarded it 22nd globally. In the 2011 rankings, Forbes ranked the NUS Business School’s Master of Business Administration (MBA) programme which has emerged top in Singapore and Asia on Forbes’ list and placed fourth internationally after IESE Business School. The Financial Times places NUS School of Business at 23rd in their global MBA ranking tables. There are about 6,000 residential places distributed between Halls of Residence and Student Residences on campus. There is a free Internal Shuttle Bus Service that plies the entire campus seven days a week. NUS entry requirements for undergraduate students are a good Level 12 or equivalent education. Having a good English language certificate such as IELTS or TOEFL is also necessary because all subjects in NUS are taught in English. NUS will then evaluate all candidates based on submitted data to determined approval of admission. For graduate or master degree, NUS requirements are more complicated. Every student has to submit GRE or GMAT to demonstrate academic ability and TOEFL or IELTS for language ability when applying. Benchmark for GRE score is 320 (verbal and quantitative) and 3.5 (analytical) or GMAT score of 650 and above. While for IELTS or TOEFL Internet Based Test (IBT), the minimum requirement is 6.0 or 90 respectively. Currently, NUS hosts 21 university-level research institutes and centres in various fields such as research on Asia, risk management, logistics, engineering sciences, mathematical sciences, biomedical and life sciences, nanotechnology to marine studies. Besides that, NUS also hosts three Research Centres of Excellence which are the Cancer Science Institute of Singapore, Centre for Quantum Technologies and Mechanobiology Institute, Singapore – a partner in Singapore’s fifth Research Centre of Excellence (RCE). Besides University-level RICs, NUS also has close affiliation with many National Research Centres / Institutes. A special mention is required for the Logistics Institute – Asia Pacific which is a collaborative effort between NUS and the Georgia Institute of Technology for research and education programs in logistics. Since its inception in 1905, the National University of Singapore and its predecessor institutions have produced many illustrious individuals. This list includes four Singaporean Prime Ministers and presidents, two Malaysian Prime Ministers, politicians, judiciaries, business executives, educators and local celebrities. This University offers a wide range of scholarships for international students and it has a variety of loan and scholarships program available. It is important to make enquiries and apply for resources of funding as early as you can.